Things to Know For Your First Visit. The Eucharistic(see Holy Communion below) Divine Liturgy is the central act of worship in the Orthodox Church. Most Sundays, the Liturgy is scheduled for 9:30 a.m.
Can I come to your parish if I am not Ukrainian? Of course you can! 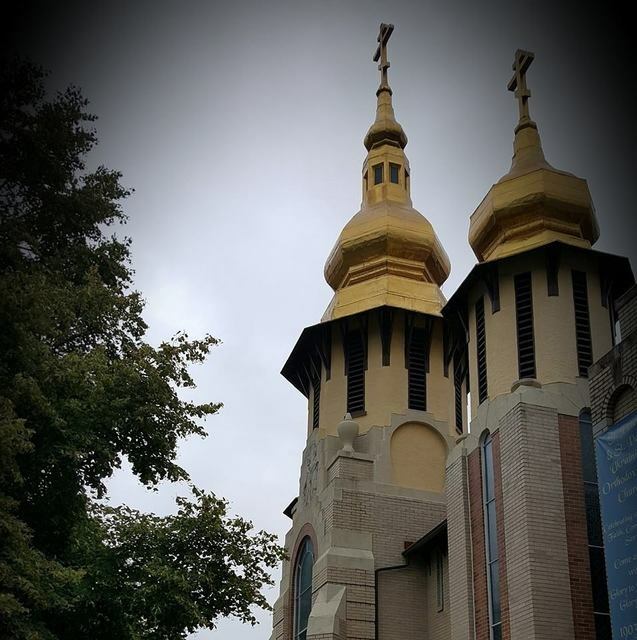 Our founders immigrated from Ukaine and our parish is under the omophor or "protection" of the Ukrainian Orthodox Church of the USA. However, the Orthodox faith is not limited to a nationality. It is the true Church of Christ and is open to all people of every back ground. In respect to the historic Ukrainian heritage of this parish, on the first Sunday of every month most of the music of the Liturgy is sung in Ukrainian language. Liturgy books are provided in the pews to help you follow the service in English. This provides our choir the opportunity to sing unique choral arrangements in the Ukrainian language. Yet, even on this Sunday, the Epistle, Gospel, sermon, and Communion prayers are always in English. On the remaining Sundays of the month, the Liturgy is 99% in English so that you may fully understand the prayers and worship. Holy Communion in the Orthodox Church is reserved for Orthodox Christians who have prepared themselves through the Church’s disciplines of prayer and fasting. Communion is not the means to an end of Christian unity, but is the culmination and celebration when such unity is achieved. Of course Christ desires that all should come to Him and be fed – if you would like to become a communicant of the Holy Orthodox Church and participate in all of her salvific and sanctifying mysteries, please see Father Steve! As we receive the Body and Blood of Christ in Communion, it should not be received casually. All are required to prepare themselves through the Church’s disciplines of prayer and fasting, supplemented by the purifying sacrament of Confession when needed (at least once a year). This includes preparatory prayers and – for those whose health would not be put at risk - abstention from food and drink for several hours preceding communion. A Church of Five Senses the Orthodox Church engages all five senses and is a church of active participation. We taste Holy Communion, we smell the incense, we hear the prayers, we see the written and human icons, we feel and light candles. Every element of Orthodox worship is meant to bring us closer to God - through prayer and action. Candles - The candles are lit as we offer up one another to the Lord in prayer. As you enter the church, you may give an offering for vigil (prayer) lights and either light your own in the front of the church or have an usher light them for you. Suggested donations are listed in the vestibule. The Nicene Creed, established at the First Ecumenical Council in Nicea in 325 AD, is the basic statement of faith of the Orthodox Church, which has preserved and confessed it unchanged since the Fourth Century. And in one Lord Jesus Christ, the only-begotten Son of God, begotten of the Father before all ages. Light of Light, true God of true God, begotten not created, of one essence with the Father through Whom all things were made. Who for us men and for our salvation came down from heaven and was incarnate of the Holy Spirit and the Virgin Mary and became man. He was crucified for us under Pontius Pilate. He suffered and was buried. And He rose on the third day, according to the Scriptures. He ascended into heaven and is seated at the right hand of the Father. And in the Holy Spirit, the Lord, the Creator of life, Who proceeds from the Father, Who together with the Father and the Son is worshipped and glorified, Who spoke through the prophets. In one, holy, catholic, and apostolic Church. I confess one baptism for the forgiveness of sins. I look for the resurrection of the dead and the life of the age to come. Amen.